This beautiful used 69' Ferretti yacht for sale is available in Palm Beach! 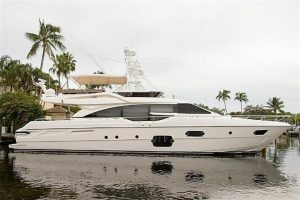 : Atlantic Yacht & Ship, Inc.
Do not miss this great deal on a beautiful used 69′ Ferretti that Joe Marino has for sale! In the first place, this sleek used 69′ Ferretti yacht is known as “Cloud Break”. In addition to this yacht being launched in 2014 you will love her condition. She has been expertly maintained and lightly used and it shows. After all, she has been maintained by a professional and experienced captain. Correspondingly her condition is just the beginning of the features this yacht has to offer! As can be seen on this used 69′ Ferretti she is loaded with upgrades and features. In fact, she features a Seakeeper state-of-the-art Gyro stabilizer. Furthermore, her four cabin layout (plus crew) makes for lots of enjoyable space. Moreover, she comes with a transferable extended engine warranties. These will cover you through May 2019 or 1,000 hours (whichever comes first). All in all this yacht is perfect for Southern cruising as well with her 90,000 BTU air conditioning systems. There are many more options so contact us for more! For more information on this beautiful used 69′ Ferretti be sure to contact Joe Marino today! For over 56 years Atlantic Yacht & Ship has been serving the yachting community. Our headquarter sales office is dockside at Harbour Towne Marina. In the heart of the yachting capital of the world, Fort Lauderdale, FL. Our in-house waterside service department provides general yacht services. This includes from new teak, to engine rebuilds, captain services, and everything in between. Whether purchasing or marketing a quality vessel, Atlantic Yacht and Ship, Inc. is your one stop resource. We provide the highest quality service and sales in the yachting industry today. Regardless if you are looking at yachts for sale, or thinking about selling your yacht. It is always wise to have an experienced broker representing your interests throughout the deal. This sleek used 69′ Ferretti for sale in Florida is a European beauty! Be sure not to miss this beautiful used 69′ Ferretti yacht for sale!